Get a taste of Australia's only tropical capital city which is closer to Bali than Bondi Beach!. 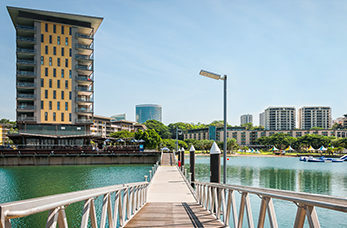 Darwin has a colourful history, having been bombed by the Japanese during World War II and Cyclone Tracy destroyed the region in 1974. Today you can relax in one of the street-side restaurants or bars, or discover the regions indigenous art in one of the many galleries. If you want to get up close and personal with some of Australia's iconic Saltwater Crocodiles in state of the art aquariums and pools. If you're feeling brave you can even swim the crocs in the Cage of Death. These 42 hectare gardens were established 130 years ago and showcase plants from around the world and many of the plants were traditionally used by the local aboriginal people. This superb museum and gallery of the Northern Territory houses an assortment of over 1.2 million natural history specimens and over 30,000 items of art and material culture. This National Park protects part of the Port Darwin wetland, one of Australia's most significant wetlands, the park lies on Frances Bay in Port Darwin.